This book is one of the best-selling self-help books of all times. So, I don’t think I need to write how great it is and that really everybody should read it and so on. Although, I’d like to mention that, if a book is this super-popular or has been popular for such a long time (this book has been around since ~1936), then there must be something special about it. So, especially, if you haven’t read many books of this kind yet and don’t want to risk reading some unsubstancial guru-stuff, you should start with the classics – like this one. Basically, in each chapter, Carnegie explains one feature of human behavior and then tells the reader which actions or which behavior is good with respect to that feature. If you’re interested in a more general summary, the Wikipedia article is actually quite good. I’ll just point out what made this book so special to me. To me, the book is not so much about influencing people, but more about understanding them. Understanding why people do certain things can be immensely relaxing. If somebody stresses us with their behavior, we tend to blame them for it and to think why they can’t just do it differently. We’re getting upset about a situation, which 1.) will not change by itself and 2.) the concerned person does not even see as a bothersome situation. Still, for some reason, sometimes we can’t stop bothering and thinking about how easy our life would be, if the person would have done it differently. Carnegie shows us, that we should instead try to understand the other person and see the situation through their eyes. He points to the fact that, in their own opinion, people are doing all things right. Whenever we are thinking that somebody should do something differently, we should remember that in their eyes, they are doing it the best way that there is. Sometimes, we’d even do the same, if we were in their situation. Understanding this, has really made me a more relaxed person. Understanding a person eventually leads to accepting the situation. At least that’s how it works for me. That’s when I can finally stop thinking “Couldn’t that person stop doing that? Couldn’t he or she simply not be here? Why does that always happen to me? Why always when I’m in a hurry?” It allows to look for solutions based on the current situation and to stop moving round in circles mentally while pondering on how miserable the situation is. This continues with the solutions presented in the book. One of the first lessons is that simply critiquing a person will not help. It will just cause the person to justify his or her behavior, but not change it. Again, I found it kind of relaxing to learn that only thinking that some person did something wrong and criticizing him or her for it, won’t help. Now, I can simply start looking for more meaningful solutions. Many books and blogs suggest methods that attack relatively marginal problems. Spending less time with unimportant things, saying ‘no’ more often, knowing our long-term goals, over-exaggerating an excuse, etc. These are tricks or hacks. You should try them, they are fun. They work for some people, and for some they don’t, and that’s ok.
What you find in Carnegie’s book, however, are more like facts. They are directly based on the most essential human characteristics. Therefore, they are so powerful. That’s the basic stuff that works for everyone. Carnegie doesn’t try to come up with some magical thing that nobody has thought of previously. He doesn’t invent new methods. He just condenses the most relevant characteristics of human behavior and the most logical responses to it. And he uses the best methods to make us comprehend and motivate us. In this book, Carnegie does not lecture the reader how the world functions and what the best strategies are. Instead, he lets us see with our own eyes, how important it is to address certain properties or behaviors of our surrounding people. This is essential, because for me, that’s what makes the difference between just browsing a book and actually getting motivated to try out some of its suggestions. And yet, I have found this feature to be pretty rare in this kind of books. So, how does Carnegie do that? The book mainly consists of examples. Of really good and comprehensible examples. I’ll try to illustrate this by simply citing two of them. The point of the story is this: “Two Gun” Crowley didn’t blame himself for anything. That’s Al Capone speaking. Yes, America’s most notorious Public Enemy […] Capone didn’t condemn himself. He actually regarded himself as a public benefactor – an unappreciated and misunderstood public benefactor. The other example illustrates two parts of the book – about showing (genuine) interest in people and about smiling. 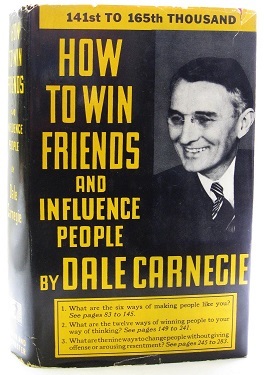 “Why read this book to find out how to win friends? Why not study the technique of the greatest winner of friends the world has ever known? Who is he? You may meet him tomorrow coming down the street. When you get within ten feet of him, he will begin to wag his tail. If you stop and pat him, he will almost jump out of his skin to show you how much he likes you. And you know that behind this show of affection on his part, there are no ulterior motives: he doesn’t want to sell you any real estate, and he doesn’t want to marry you. Did you ever stop to think that a dog is the only animal that does not have to work for a living? A hen has to lay eggs, a cow has to give milk, and a canary has to sing. But a dog makes his living by giving you nothing but love. For me, this was one of the most effective examples in the book. Again, instead of interminably explaining things, he simply illustrates situations we all know. After reading this, I wasn’t just thinking, “yeah, interesting”. I was instantly like, “Oh my God, I can give this feeling so easily to other people! From now on, I want to be smiling all day to all people.”… This kind of motivation is exactly what I would want from such a book. So, if you didn’t know this book or simply have forgotten about it, here is the reminder: yes, you should finally read it!